This was such a fun creation to make––it's definitely Food Art. 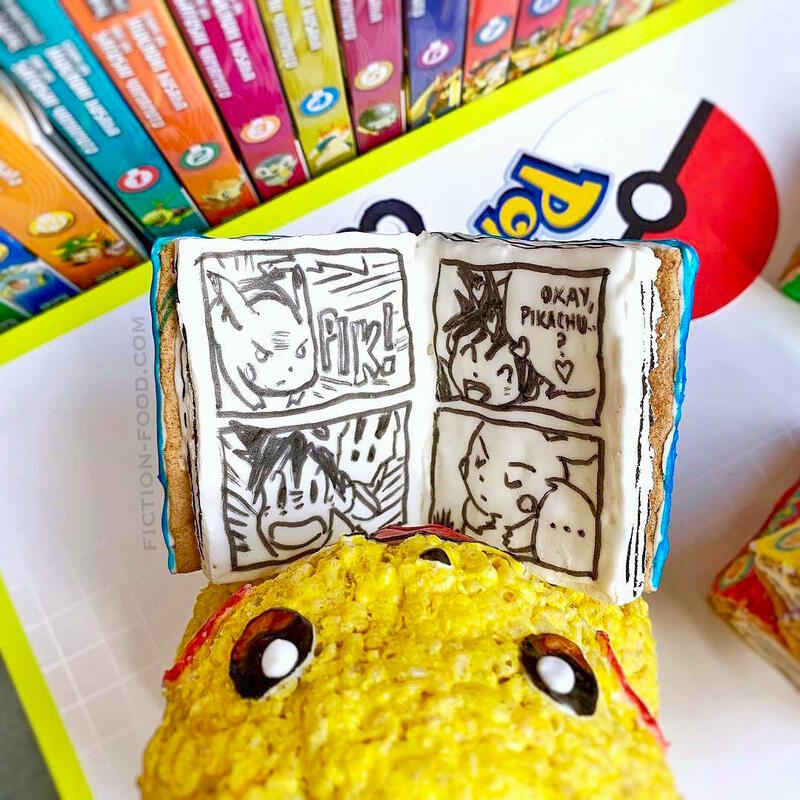 Pikachu was sculpted from colored rice krispie treat mixture, and the manga is made from graham crackers, homemade marshmallow, & royal icing. The coloring and drawing was done with edible food color markers. In a small bowl, stir the cold water & gelatin powder, & then put it in the fridge for several minutes to solidify. In a small pot on medium-low heat, combine the sugar, 2 Tbsp. water, & corn syrup &, without stirring, heat until the sugar has melted. Break up the solidified gelatin & dissolve it completely in the sugar mixture. Pour the sugar/gelatin mixture into a large mixing bowl & add vanilla flavoring & a pinch of salt. Beat on high with the whisk attachment until white, fluffy, & doubled in size (it should also be glossy & stiff). Line a large tray with plastic wrap & spray with non-stick spray. Pour the marshmallow mixture onto it & spread it out evenly to about 1/2” thickness. Spray another sheet of plastic wrap & then lay it spray-side-down onto the marshmallow. Make sure all of the marshmallow is covered with plastic & then let sit on the counter for a couple of hours to solidify. Use a pizza sprayed with non-stick spray to cut. 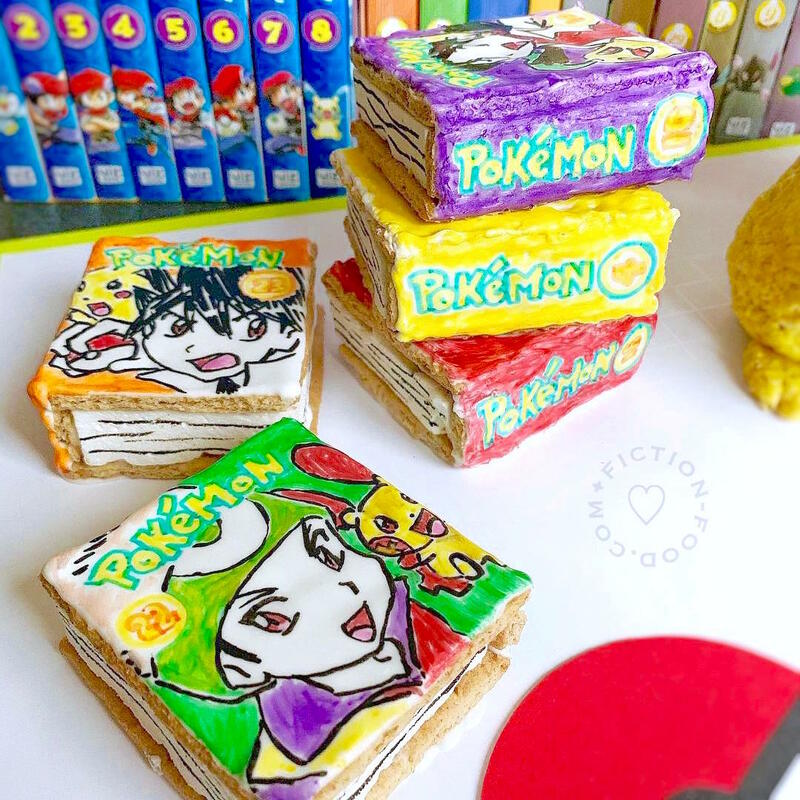 To make the books/manga: For the right size marshmallow pieces, lay half of a plain graham cracker on the marshmallow & cut around it, using the cracker as a template. Grahams come in large rectangles with 4 sections, so cut (sawing gently with a sharp serrated knife) & break several in half horizontally. This will give you the front & back to your books. For the spines, carefully cut pieces that are the same thickness as the marshmallow (about 1/2" wide, trim to fit). Stick all of the components together with royal icing (recipe below), let dry, & then pipe & spread (with a toothpick) royal icing on the cover & spine, letting each side dry first. Draw onto the hardened icing using edible food color markers. Use black to draw the page lines directly onto the marshmallow. Secure the books onto the base of the sculpture, or stacked onto one another, using royal icing. 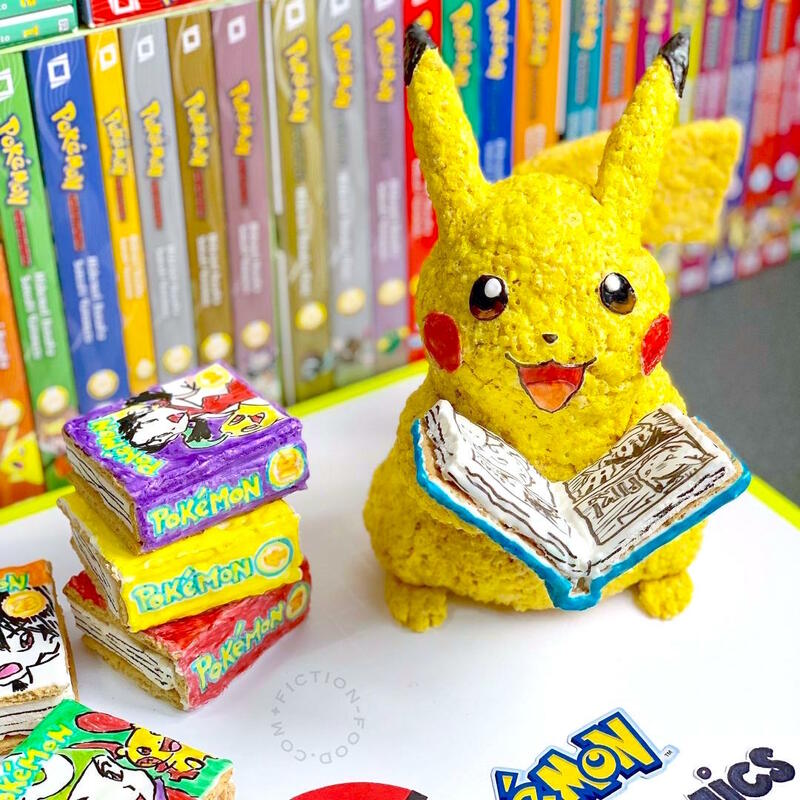 Keep in mind, if there’s a side of the book that won’t be seen, there’s no need to ice or draw on it (like with stacking, or laying on the base. For the open book, I sliced a section of marshmallow in half through the middle, secured it to the grahams with icing, & piped royal icing onto the open sides to create a smooth flat surface to draw on. 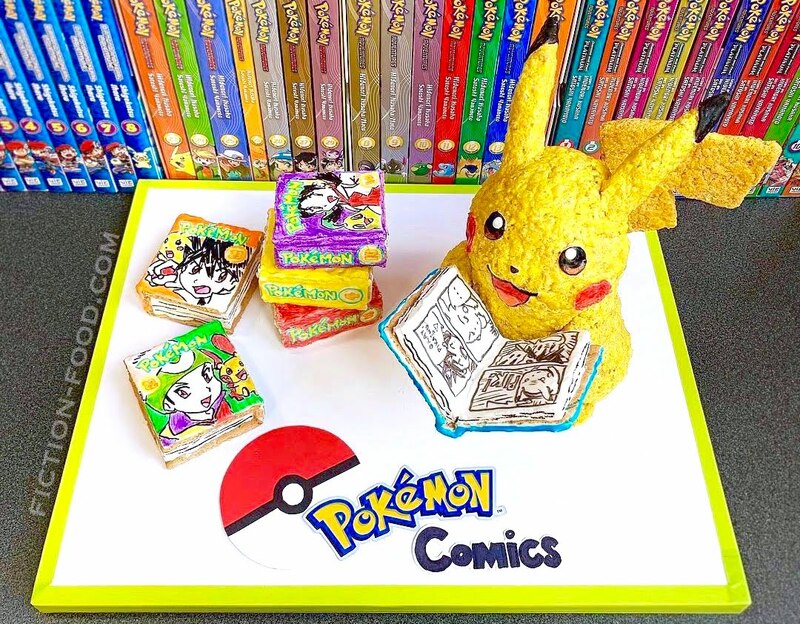 I secured the book though the marshmallow to Pikachu’s stomach using hidden toothpicks (not royal icing), resting it on Pikachu’s arms (though they weren’t really holding any weight). Put the mini marshmallows into a large microwave-safe bowl & zap for about 40 seconds. Squeeze in 2 generous drops of yellow gel coloring & stir until completely yellow. Quickly add in the Rice Krispies & stir a bit & then get in with your hands, coated with crisco shortening, to mix thoroughly so everything is an even yellow. If it’s getting too stiff, microwave for another 15 seconds. Shape the mixture into Pikachu’s body. 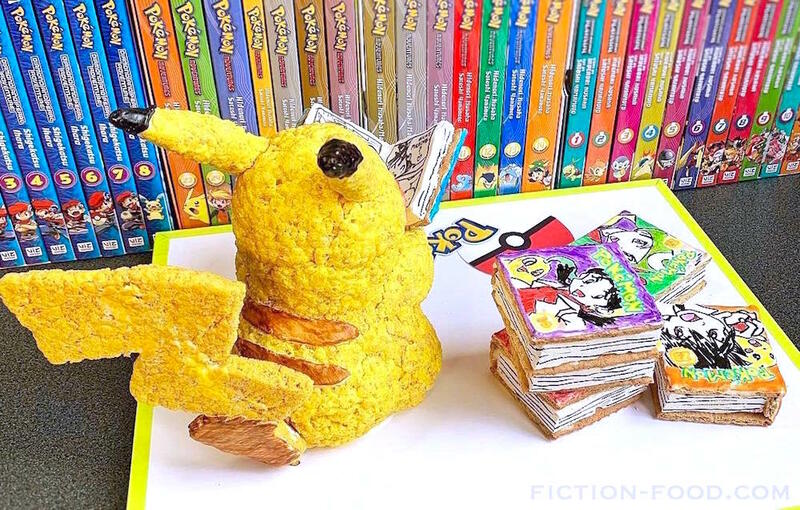 Repeat the steps to make another batch & form Pikachu’s head. Make a third batch to shape the ears, arms, & feet. For the tail, flatten out the shape on a tray. Pipe on royal icing (recipe below) for the eyes, nose, mouth, cheeks, ear tips, back stripes, & color at the base of the tail. Let the icing harden. Color with edible food color markers. 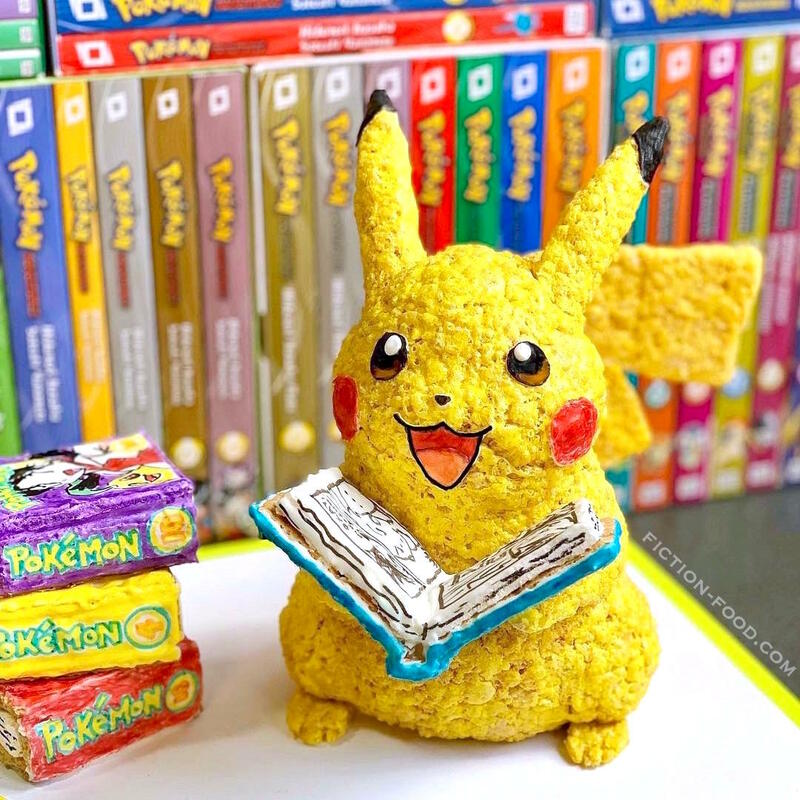 Assemble Pikachu using toothpicks, or simply the stickiness of the Krispie treat mixture. Use a small skewer to go up through the tail, & use little toothpicks through the larger top of the tail if needed to keep it from drooping. Instead of putting the tail end/bottom directly into Pikachu’s behind, I pushed it through the foam board base right behind Pikachu, for extra security. Secure Pikachu to the base using royal icing. In a large, clean (& dry) mixing bowl, sift the powdered sugar & then mix in the cream of tartar with the paddle attachment. Add the egg whites & mix until smooth with stiff peaks. Add water, 1 tsp. at a time, until it’s thinned a little, but isn’t runny; you want it pipe-able & a little but spreadable. Sit a large piping bag into a tall cup & open it over the cup edges. Scoop the icing into the bag & then twist it closed & secure with a rubber band. Snip a small opening in the end. 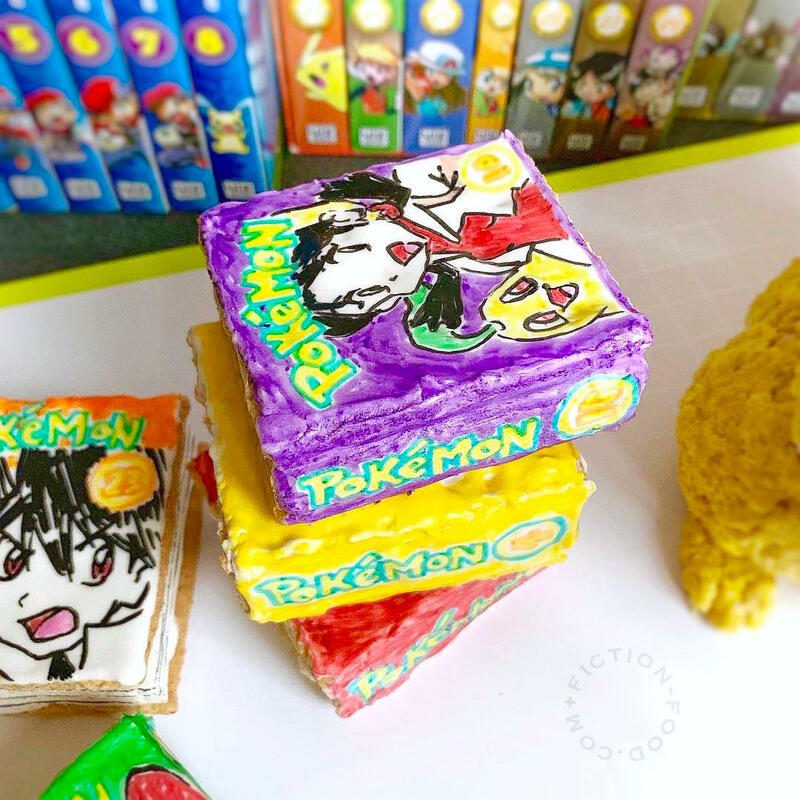 When piping icing onto larger surfaces, like the manga covers, use a toothpick to smooth it out before it can dry. Repeat the steps if you need to make more icing.